As I continue to tilt at the VMware windmill I’m facing fanbois telling me that all you have to do is plug the EVO:RAIL in and turn it on. This of course leaves out the fact that the little sucker still needs to be connected to the network. VSAN also uses L2 multicast to communicate between nodes. Back in the dark ages when I was a network guy multicast was an iffy thing. VMware VSAN uses L2 Multicast to provide synchronisation and signalling between each instance. In specific terms this is a clever use of Ethernet Multicast to reduce network traffic. In reality, it will commonly cause problems. More capable switches support IGMP snooping, meaning that the switch will observe IGMP messages and only forward multicast traffic for a particular group over ports where IGMP messages were seen from a host requesting to participate in that group. It is not necessary to configure IGMP snooping, but it does insure that ports that don’t need to see the multicast traffic don’t see it. In my experience, some switches have IGMP snooping enabled by default. Some do not. Unless multicast traffic streams take up significant bandwidth, it’s not a big concern. Ethan is, of course perfectly correct but my experience of L2 Multicast is far more painful and brutal. 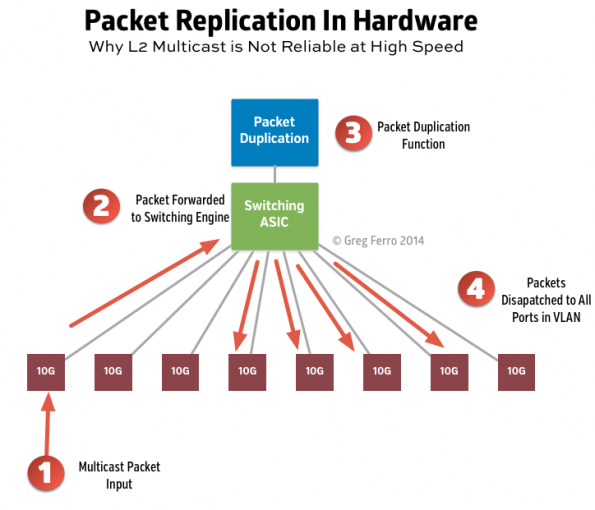 Any type of Multicast (L2 or L3) requires that the internal silicon of the switch must duplicates packets. Importantly, the switch must be able to perform this function at very low latencies at high volumes in real time. I’m talking about nanoseconds intervals and tight clocking on the internal architecture of the switch hardware. The following diagram shows how the four key steps inside the switch itself. In cheap switches, the packet duplication function could be performed in software on the management CPU and will result is high latency and packet loss. In some Ethernet switches, the packet duplication function might have a limited capacity of tens or hundreds of megabits per second. The best switches are those that implement the packet duplication in the crossbar switching silicon and can perform line speed duplication and wire speed switch of Multicast. There are very few switches that are able to do this at all and they all cost very serious money. My general assumption is that any form of Multicast is always unreliable. Vendors implementations are universally poor quality and testing is almost non-existent since very few customers actually use Multicast in any form. The ONLY way to be sure is to conduct your own testing (which costs about ten to twenty time what a switch actually costs). The Internet Group Multicast Protocol (IGMP) also has limitations on its performance but for a VSAN setup you are unlikely to have problems. You could try capturing packets on all of the ports and detecting which ones are being lost under what conditions. You will need network taps, concurrent packet captures on multiple ports and some method of comparing capture files (Don’t call me though, my life is too short for that short of pointless behaviour). Switches simply do not have features that will show packet loss in the crossbar / switching fabric. I often find that NIC Drivers implement multicast badly. I’m sure that VMware think they have tested ESX drivers but I would still be dubious. Without “user feedback” (aka victims who found the bugs) it unlikely that test coverage of multicast is comprehensive. Again, finding vendor bugs is not life enhancing and I’m still waiting for a discount when I find them. After all, they saved money by not testing properly. switch more than 5 years are almost certain to be a problem. cheap or low cost switches could use CPU instead of ASICs for IGMP and packet duplication. These will drop packets at moderate transfer rates and could cause VSAN corruption. purchase a really expensive switch from a well known vendor who will promise that their L2 Multicast is “real good”. Expect to spend many weeks logging bug reports because developer testing coverage is low or non-existent on features that customer do not use. You can be sure that bugs are delivered directly from the developer to you. blame VMware for making a bad design decision to use Ethernet as a communication protocol. You think they would have learned from the MAC-in-MAC foolishness of vCloud 1.5 ….. but apparently not. Make bug report that Ethernet Multicast is highly unreliable. A modern switch is design to route and switch IP Packets at high speeds. 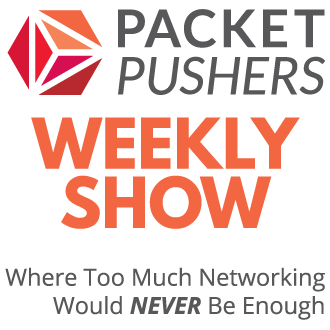 It makes much more sense to use a full mesh of IP sessions that are tolerant to loss and jitter. Importantly, this operational mode is widely tested and validated by the vendor and in customer use. VMware VSAN should use reliable and simple networking design instead of choosing too-clever solutions that are unreliable. You would think VMware would learn from previous failures ….. but I was hoping for too much. An Ethernet and IP network always assumes that packet loss is normal. Whether oversubscription, contention, output buffers, reconvergence – unless carefully and explicitly designed from the hardware upwards, loss will happen. For example, Cisco FCoE works when every device is a director-class hardware product configured to specified guidelines, with storage traffic strictly controlled and managed like a FC network. So no, VSAN will never be reliable while storage based no SCSI doesn’t understand the lossy propagation. What you need is a filesystem based on object storage that assumes variable loss, latency and outages in normal operations. FibreChannel networking did a great but costly/expensive job of hiding this from storage professionals. Time to wake up and face the reality. Wonder what the real impact would be of letting the switch flood the multicasts to all ports. Presumably broadcasts are relatively dependable. Flooding multicast to all ports would defeat the purpose of network segmentation and could result in a serious security issue if someone is watching the broadcasts from the vSAN. Additionally, on a larger network, flooding packets from a vSAN could result in degraded server performance due to the servers having to drop inordinate volumes of broadcast traffic. I would make the problem worse. Packet replication engines would need to increase performance to handle the full output rate of the switch. For example, receiving a 1Gbps stream of multicast would require 51x1Gbps of duplication for 48 server ports and 4 uplinks for a total of 51Gbps. That’s expensive silicon. Multicast doesn’t, has never, and never will scale to acceptable limits. can you expound on your comment? to the best of my limited knowledge, IGMP Snooping respects VLAN boundaries and in this context should not degrade security any further than multicast already does. In IP protocols, the network is assumed to have some limited amount of packet or frame loss. So packet loss, jitter or delay is handled in the protocols – for example. ARP will retry the broadcast three time (typically) before failing. Storage assumes the opposite and network reliability become a critical issue. Greg, you’ve always been a remarkably realistic network bloke who knows when good enough is good enough. Yes, multicast complicates VSAN unnecessarily, and yes, block storage protocols don’t like network imperfections. But really, FC attitude when iSCSI has worked so widely and so well? When we don’t know if VMWare tweaked its VSAN protocols for whatever level of 10GbE reliability it found in a year or two of testing? Having survived token ring v. Ethernet, I hesitate to tout gold-plated theoretical superiority when simple, cheap and fast just works. I do not, and never have promoted the use of FC. However storage compute over iSCSI is far from acceptable. In particular, a network outage can cause major damage/corruption to disk images. Thats what storage industry needs to fix. Thanks for clarifying. Maybe Nutanix can fix? Or ZFS? Guess I expect disk-corrupting network outages to be zebra swans b/c I haven’t seen one yet. Around here it’s human error & UPS failure. But you’ve seen more iSCSI than I have. Yep. And it gets much more complex from there just to get basic L2 Multicast operational. Well FibreChannel isn’t suitable for this type of product. The hassle of getting Fibrechannel adapters and configuring FC switches makes VSAN even more complex, not what you want at all. I tend to disagree on your statements. The intent of my reply was that VSAN was intended to move AWAY from FC based SAN attached storage. 1. Storage technology needs to advance so that compute storage interactions use a modern method. It is time to replace LUNs, Blocks and SCSI signalling. 2. That VMware VSAN choice of Ethernet Multicast is a poor decision in practice. In theory, it was a good idea but in practice it is spectacularly stupid. You should check your tech support statistics and I am sure that customers have large numbers of intermittent problems with VSAN. Feel free to report back. Your comments around getting rid of LUN, Blocks and SCSI would fall in the same BS category as me trying to arrange getting rid of Ethernet. Your punt seems to have the intention to incriminate the storage IO stack in its current state but the way you describe it is like trying to boil the ocean. On my blog I’ve hassled numerous network vendors on developing/adopting FCoE and if you think customers adopting VSAN is bad I think you should go back to your “favourite” vendor Cisco and start bugging them on how in the hell they came up with the idea of developing FCoE. Bolting an 3 decade old protocol (SCSI) plus a 2 decade old one (Fibre Channel) onto an 4 decade old one (Ethernet) is beyond my belief. Another comment in one of your replies mentions “Network professionals have very limited time to understand VSAN applications and its needs.”. It’s come to my understanding over the past 8 years as a support engineer and another 12 years as an administrator/engineer/pre-sales/architect that Network Professionals have extremely limited time to learn about anything else besides networking. Application, OS and overall IO stack behaviour is beyond comprehension to them so they start writing these snarky blog-posts without even knowing what lies beneath the surface that makes developers choose between the options available to them. 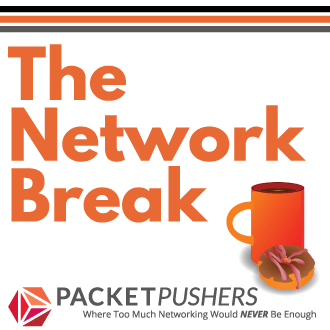 I agree that the networking stack is very diverse with technologies that branches off into a hundred directions like OSPF,BGP,MPLS and a gazillion more acronyms all to be able to bolt together the inferiority of ethernet. So instead of making comments of getting rid of LUNs, block and SCSI you might want to start thinking of getting rid of ethernet and come up with a suggestion you might want to present to IEEE. Lets see if anyone takes you serious over there. Your first reply to me where you state that “Fibre-Channel isn’t suitable for this type of product” is also going into a dead-end. Using Ethernet for VSAN is not based on a technology decision but a commercial one. Heck, VSAN in itself is based on a capex/opex scale to provide cheap storage. If money was not a decision point FC would have been the perfect technology for VSAN as p-t-p traffic flows without over-subscription and frame-distribution mechanisms have been in FC switch hardware designs for as long as FC exists. I suggest you start having a good look in the mirror and ask yourself if and how you might want to contribute on these kind of discussions after you’ve investigated the subject more thoroughly and obtained feedback from the people who actually made this choice. I have been consistently critical of FC AND FCOE for at least eight years (search this blog for FCOE) because they perpetrate block storage using SCSI commands for connecting compute to storage. FC/FCOE are fatally flawed protocols because the payload assumes reliable transport which can never happen at scale, regardless of the underlying network. NFS & iSCSI are attempts to support scalable storage networking but strictly limited by the precepts of block storage using SCSI commands. I’ve been participating in these storage networking discussions for more than 8 years and storage experts consistently agree with my perspective. I been through these debates so many times and well aware that nothing new ever happens in storage. VSAN incorporates the same flaws and faults inherent in any storage system that use block storage. Using Ethernet Multicast will create strict scaling limitations in deployment because 1) VLANs do not scale 2) packet replication does not scale. Unlike you, I live and work in the real world with regular demonstrations of the difference between theory and practice. My experience suggests that VSAN will have significant problems with intermittent failures and stoppages in wider deployment because of these problems. These problems won’t be easily identified, if ever, and you will end up with the problem that Cisco has with Nexus 1000v software switch with an eternally damaged reputation for buggy product. By all means, come back in a year and lets see how it worked out. I share your thoughts on FCoE but categorically disagree on your view of FC. If the existing protocols would have been good enough to carry a channel protocol like HIPPI, IPI and SCSI then FC would probably never have been developed in the first place. The reason FC actually exists is because it is the least flawed protocol of them all and was developed for datacenter storage purposes. I would really like to know who these “storage experts” are then. There is a reason why any serious operating system like z/OS, NSK, OpenVMS doesn’t want to have anything to do with iSCSI and/or NFS. It is unreliable and requires to much overhead to overcome this limitation. You don’t know what world I live in. I do know that the world I live in takes customer data serious hence we have reliable kit and protocols. If we don’t its gone, forever. The ethernet/ip networks just throws it away when it suits them and start requesting it again. If the storage side would do the same we would have something to answer to. VSAN in its current incarnation, wasn’t meant to scale to huge proportions so your argument falls flat. Again, start making allegations after you’ve done some serious investigation. Agreed. Compute storage interactions need to use a modern method. PCIe flash. evlonden! Agreed. As technology is changing So, we must have modern techniques to Compute storage interactions. My name is Rawlinson and I’m a member of the storage and availability team at VMware and mainly responsible for all things related to VSAN. Thanks for sharing your perspectives around multicast and VSAN specifically. As I’m intimately involved with VSAN and vSphere at VMware, I feel you might have left people with the wrong impression. First, L2 multicast traffic is only used for coordination between VSAN nodes. It is not used for data path. Many of the performance concerns you raise might be valid if otherwise, but the amount of traffic and associated performance requirements for multicast are quite minimal. While we don’t recommend people use substandard switches, we don’t place an undue burden on multicast performance and/or features. If multicast were to completely fail or misbehave badly for some reason, no data would be lost or corrupted. Yes, a VSAN cluster wouldn’t be usable if this were to occur, but this would be the same for any general network failure. That being said, implementing VSAN requires the vSphere team and the network team to coordinate. Once multicast is correctly configured, our observed experience is that it tends to continue working without any problems. It seem clear that you don’t live the real world but one of your own imagining. The challenge that you face is that the decision to use multicast will scale your tech support problems around product reliability. More VSAN instances means ever increasing tech support problems because of the network and poor Multicast quality in network devices. Network professionals have very limited time to understand VSAN applications and its needs. In term of the overall networking portfolio the data centre is less than 10% of their working estate and matters very little. VMware must recognise that they are are fringe/non-core to the operation of the Enterprise network and must work to reduce their impact. The biggest problem is about the decision to use SCSI like protocols that assume that the storage is perfectly connected to the CPU/Memory. But people like you continue to hack around with half-assed solutions that emulate 30-year old technology instead of fixing the problem by replacing how OS connect to block storage devices. I don’t really see how VSAN will be successful in its current form because it will not be reliable enough in real world operation. WRT to the snarky comment about jumbo MTU, again, the data centre network is a very small part of my responsibilities. For a typical large enterprise, configuring jumbo MTU typically requires a Class-1 outage window and allocation of 40-100 hours to review hardware/software compatibility of each switch. The reality is that configuring jumbo MTU is a very low priority compared to other activities. Jumbo Frames work ok although occasionally I’ve seen some issues related to buffers and faulty cabling/errors. Good luck with the product, you will need it. I’m doubtful it will be successful in its current form because of poor reliability in its design. For most use cases, the use of IB for RDMA data transfer is too complex and costly in terms of developer time, assuming that people have even heard of it. Infiniband is fading away as Ethernet gains even more momentum. Basically it is cheaper and more practical to buy more 100GbE instead of higher priced QDR IB. The use of RDMA is too hard for most developers to build into their products. Much easier to open a socket and ignore the networking. Multicast knowledge is also rare among network engineers. That is what makes this decision by VMware even dumber than usual. __Storage Protocol__: Actually, VMware has forced major change onto the storage market already. It storage APIs caused much distress among the array vendors and the support for NFS & iSCSI led to faster transition away from FibreChannel. Now that EMC owns VMware, it is much less likely that change will originate from VMware since EMC has limited interest is changing the market. It extracts 90% profit margins from the sale of existing assets as very low cost and will continue to service shareholder interests ahead of customers for as long as possible. __MTU Change__ You are conflating the change of a single, very small network with high priced and modern NX5K switches against the reality of thousands of data centres which have different hardware. Cisco Nexus has penetrated a very small percentage of the market, perhaps as much as 20%. The vast and silent majority continue to run Cat6500 or other older devices on a 10-year depreciation cycle. Your personal experience is invalid in the context of industrywide debate. Thanks for your comments, thoughtful and well written. Actually the dynamic between EMC and VMware is a little strange. I’m not sure EMC likes this whole VSAN kick all that much but they’re leaving VMware to their own devices so it ends up being a little cooky and they’re starting to compete with each other little bit. I’m not a believer in VSAN yet myself but I’ll give it a fair shake. Re: the MTU change, I understand what you’re saying. I’ve worked in a lot of large data center environments on a variety of platforms (mostly Cisco Nexus and Catalyst, some Arista, some Juniper.) To your point I probably wouldn’t consider running VSAN (or any storage traffic for that matter) on Cat6500. Mostly Nexus kit ends up being a silo off the core so we can limit the impact of those types of changes. If they’re still all Cat6500 though then yeah I wouldn’t touch that with a 100 meter pole and a riot shield. For a project like this (or iSCSI or NFS backed virtualization) I would consider dropping in new access switches to deal with storage traffic and likely the VM traffic as well. This would be to minimize the impact over the larger enterprise network. Of course this means more money spent on what is allegedly supposed to be a more “cost effective” problem (part of my reason for disagreeing with the value prop of VSAN). You’re now adding a couple of 10GbE switches at the top of your hypervisor rack to account for this new traffic which could be from 8k per to 20k+ in cost. At that point you might as well buy a monolithic array and some Brocade 6500s/300’s to keep your storage traffic separate. Thats good news but VSAN is not designed for use with “Enterprise Quality” switches. The product is intended for use in SMB/SME markets to replace the cost of storage arrays for smaller installation (say, up to 16 physical servers). Those markets don’t have enterprise quality switches. Hence the root of my concern around Ethernet Multicast. (note not IP Multicast, and it is very different).